To build healthier communities, a logical place to start is through improving nutrition. Ensuring that everyone has access to healthy foods has major implications for preventing chronic diseases and for improving overall community health. The availability of healthy foods — in grocery stores, restaurants, schools and farmers markets — is the hallmark of a thriving community. Yet numerous systematic challenges create barriers to access. In our region, access to healthy foods is marked by inequities in transportation, availability, price and even time. Low-income neighborhoods, in particular, have the impossible task of finding accessible fresh fruits and vegetables, at a price they can afford. Residents who primarily rely on walking or public transportation have a plethora of cheap, fast-food options at their fingertips, but lack nearby grocery stores stocked with healthy food. Likewise the investment of time to travel to a grocery store via public transportation, making several bus changes in the process, is an unattainable luxury for the many who work several jobs. Locally, there are more than 66,000 people in Wyandotte and Jackson County, Mo., living in food deserts, which are areas that lack a nearby grocery store. In response to this problem, communities in the metro area have mobilized efforts to create greater access to healthy foods. Groups are partnering with stores owners to stock healthy, affordable food. New grocery stores are being built, old ones retrofitted and mobile stores sent to underserved areas. Historically, hunger relief organizations tended to focus primarily on getting any food they could to people in need. Unfortunately, the easiest food to store and distribute is nonperishable products that can be high in sodium, fat and sugars. In the past decade, however, the shift to local, healthy food has moved into this realm as well. Organizations are now focusing on getting nutritious foods into the homes and stomach of hungry people. Enter urban agriculture, which has grown (pun intended) dramatically in the past decade. The number of school gardens, community gardens, residential gardeners and farmers has swelled. 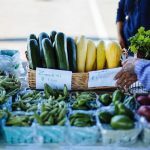 Growers are attempting to keep up with the increase in demand for fresh, locally grown food and are benefiting from policy changes that are friendlier to urban farming. Better health starts with better food. And when one of the biggest inhibitors to eating healthy is access, it makes sense to start there. So with the help of our partners, we’re working to make fresh, whole foods available to the entire community. This blog post is part of A Healthy 10.